Is there a better place to spend New Year’s Eve than in Door County? The Door Peninsula has everything you’d find in New York City—fine dining, shopping, music, and a ball drop at midnight! Sister Bay may be the place to celebrate New Year’s Eve this year. —Throughout the afternoon watch a professional ice sculptor carve his designs. —The Theresa K. Hilander ice skating rink should be open for you to try your skill at ice skating with family and friends. —Plenty of great restaurants are open throughout the day and evening. A word of caution, you may not get an evening reservation at this late hour—but give it a try. —Shopping galore throughout the village. (And check out the midnight shopping!). –If you didn’t check out the Christmas light displays through town and at Waterfront Park be sure to drive through town–dazzling. 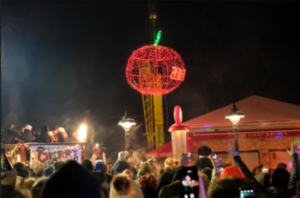 —A spectacular New Year’s Eve fireworks display at the Sports Complex starts at 8:00 p.m.
—Radio Station 105.9 The Lodge will be holding a dance party with the greatest party tunes of all time and that kicks off at 10:30 p.m. from Cherry Ground Zero at The Garage (behind Husby’s). –Space and Spot, two Sister Bay favorites (Spot-clothing, Space-household) will open for shopping 10:00 a.m. to 6:00 p.m. today, and then again for your midnight shopping spree from 11:00 p.m to 1:00 a.m.
—At midnight the 300-pound, 6-foot, red sparkling Cherry ball will drop. 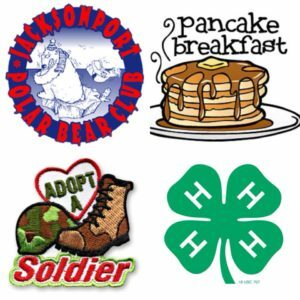 A benefit pancake breakfast will be held at the Island Fever Restaurant. Breakfast starts at 7:30 a.m. and serves until 10:00 a.m.
Pancakes, sausage, Door County Coffee, and juice boxes for the kids. The breakfast will be worked by parents and children involved in the local 4-H club. Proceeds will be donated to the local 4-H club, and the charity of their choosing–the Adopt a Soldier Program. Island Fever will offer its full food menu after 11:00 a.m.–just in time for lunch before or after the Polar Bear Swim! Join in the fun and watch—or participate in—the Jacksonport Polar Bear Club’s 32nd plunge into Lake Michigan. Festivities for the plunge begin at 10:30 a.m. at Lakeside Park with swimmer registration. The swim will be held at noon. Hang around Jacksonport for some friendly local mingling at the park or at Island Fever, or you might head over to Egg Harbor for the New Year’s Day Parade. If you catch lunch at Island Fever in Jacksonport at 11:00 a.m. and watch the Polar Bear Plunge at high-noon, you can make it over to Egg Harbor for the New Year’s Day Parade. This is the 40th annual parade. If you want to join in the parade, no registration is necessary—just dress up, decorate your old car, ride your horse, whatever your fancy. You are limited only by your own imagination. Parade line up begins at the Stella Maris Parish parking lot at the south end of town and travels north to County E.
Parade watchers can watch the eclectic and impromptu parade entries between Harbor School Road and County E.
The temps today will hang in the middle-30s. There will be a chance of light snow in the morning, and possible rain and snow in the afternoon. There is a possibility for snow accumulation of 1-3 inches. Tonight will bring blustery weather and temps in the 20s. We should see snow in the evening and then another chance of light snow after midnight. Wind gusts of around 35 mph could create some blowing and drifting snow. The chance of precipitation today and tonight is at 100%. A colder day with temps in the lower 20s, and the sky mostly cloudy. We’ll see a slight chance of snow in the morning. Dress warm and have fun!